Students will complete research on a historical figure and create a video biography of that person. Many students are familiar with Ken Burns’ groundbreaking documentaries. While many students dread writing biographies, ask them to transform their writing into a compelling digital documentary about a person’s life to motivate them to practice this type of informational/expository writing. Introduce your students to biographies by reading a few of them first. Jerry Spinelli’s Knots in My Yo-Yo String: The Autobiography of a Kid or Daniel Dyer’s Jack London: A Biography provide insight into an author’s background and help students learn how personal experiences affect a writer’s voice. Did the person’s background influence what he or she believed in or how the person acted? What personal qualities helped or hindered this person? Was this person admirable or simply famous? 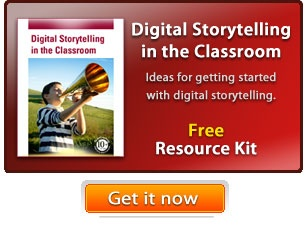 Let your student's know that they will be writing biographies and then transforming them into digital documentaries. Provide a list of people for students to choose from or have your class brainstorm a list. You could focus on presidents, famous people from your state, inventors, or authors. Have students select a person and complete research on this person and the time period in which he or she lived. Rather than focusing on famous people, consider tasking students with creating short feature films about local community heroes or even family members. When their research is complete, work through your normal biography writing process. Depending on student writing ability, you may want to give them an outline for what information should be included in each paragraph of the biography. When a first draft is complete, have students pair with another student to edit and revise their rough draft before publishing a final draft. Form small teams students who have studied the same person or are interested in making a video of a particular person. Have the teams review each team member’s biography, highlighting the parts that they like the most. The team should then work together to create an outline of their ideas and begin developing a storyboard. Depending on time, have team members not building or editing the final vidoe develop marketing materials about their biographical film. Have the teams share the video biographies with the rest of the class, at a school assembly, or even on local access television station. Make sure to evaluate the rough draft of the biography and the productivity of the team discussions before you assess the final biography. You will also want to evaluate the process the team uses to identify topics and well-written sections of the initial biographies as they write their screenplay. The screenplay serves as another tangible example of understanding and skill, as does the storyboard of the screenplay. The video biography will serve as the culminating project and summative assessment. You may also want to assess team work, responsibility, organization, and problem solving. Individual Development and Identity– Personal identity is shaped by one’s culture, by groups, and by institutional influences. Examination of various forms of human behavior enhances understanding of the relationships among social norms and emerging personal identities, the social processes that influence identity formation, and the ethical principles underlying individual action.